Following my earlier report of a price drop on the 34m Sunseeker motor yacht Cassiopeia, Arne Ploch at Camper & Nicholsons sends news of a €450,000 price drop on her namesake, the 32m Cassiopeia. Launched by Holland Jachtbouw in 2004, this Cassiopeia combines impressive performance and fast cruising speeds with tradition and elegance. A popular charter yacht, her traditional teak interior is complemented by sophisticated entertainment and communications systems, not to mention a vast array of watersports equipment; the perfect combination of what is best in old and new. Immaculately maintained with only one owner over her lifetime, this charming gentleman's motor yacht is in excellent condition and represents a superb opportunity to purchase a Dutch-built, pedigree, performance cruiser. 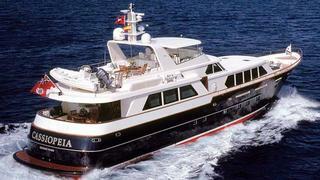 Previously asking €4.95 million, Cassiopeia is down to €4.5 million.